To say basketball fans have been treated to something special thus far in the NCAA Tournament would be a great understatement. Sure, there were a lot of chalk wins from Friday to Sunday, but you’d be stretching to complain as a fan in seeing who has advanced. The upset gods were more than generous to us on an opening Thursday that featured five one point games — and that number doesn’t even include UNC’s close call against Harvard, Arkansas’ tight battle with Wofford, or the Ohio State/VCU overtime thriller. Every March we’re not only lucky enough to witness multiple Cinderella teams and their magic rides, we’re also lucky to witness athletes reach their peak physical and mental performance levels on the big stage that is March Madness. This whole tournament acts as a culmination of the grind and preparation from a season that began sometime around midnight this past Halloween. In the wake of all that work, with only a National Championship remaining on the goal list, some guys can put their team on their back and say “let’s go,” taking on most of the work, usually in the form of filling up the scoring column. Others carry their teams by being floor generals — assist men, if you will — who lead the charge on offense. Others still are glue guys, stuffing stat sheets wherever and whenever possible, often times as a result of hustle plays that leave them stuck on the court. The younger Alford was nice enough to put his team, coach and dad Steve on his back in UCLA’s contest against SMU — a thrilling and controversial 60-59 victory. Alford is averaging 24.5 points, 39 minutes and 3 assists per game through two victories. He’s also shooting a disturbingly healthy 12 of 16 from three-point land. Staten has been mostly a floor-general type, but he’s been a bit of an ‘everything’ guy, too. Staten has compiled 13 assists to just seven turnovers with two steals, 21 points and 5 rebounds through the Mountaineers’ first two games, he’s also logged at least 33 minutes a game, which is a lot when you consider the demands of playing in coach Bob Huggins’ frenetic defense. Terry Rozier drives with the ball on Northern Iowa. Of all the players on this list (and those who came close to making the cut but didn’t) none are more vital to their team’s success than point guard Terry Rozier. 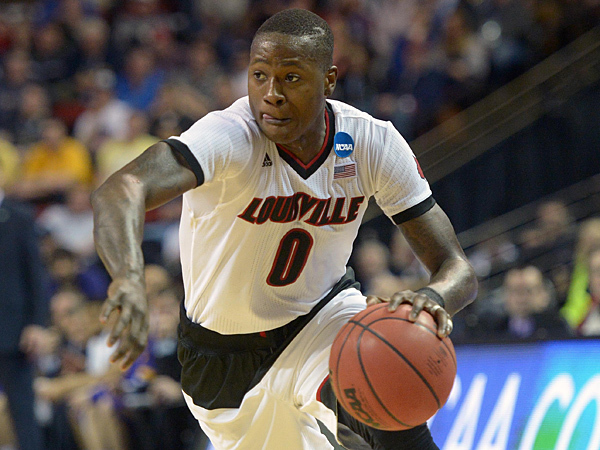 After xoach Rick Pitino dismissed star point Chris Jones from the team, the outlook was pretty murky for the Cardinals going forward, but Rozier has really answered the bell. He was electric in their victory over Northern Iowa that sent the Cardinals to the Sweet 16, pouring in 25 points on 8 of 13 shooting, seven assists, five rebounds and seven assists with just two turnovers. Similar to Staten in his ability to do a bit of everything, Winslow was amazing through weekend one. Just ask Coach K, who following his team’s win over San Diego State, gave a glowing review of his freshman forward unlike any review I’ve ever heard before from the Hall of Fame coach. Simply put, there isn’t a guy filling up statistical categories in a more efficient manor than Winslow has been. Nineteen points on 8 of 14 shooting, 21 rebounds, 12 assists, four blocks and four steals in just 58 minutes of play. Look out, Utes. Spangler may or may not be a name you’ve heard of, but the junior big man has made his living out of crashing the glass. He’s scored just 15 points, slightly below his career game average, but he’s done so while shooting 50% from the field and pulling down a monstrous 23 rebounds. The most impressive statistic, though, is his average of three offensive rebounds per game, giving his guards ample opportunities for second chance points.